Trinity Steel would like to announce the commencement of Phase II of our long term planning strategy. In 2014 we acquired a structural steel fabrication facility in Trinity, Texas which is now known as our Trinity South facility. With this acquisition, we invested in several pieces of state of the art automated equipment, reconfigured process flows and added additional roofline to the facility. Now as we begin Phase II, we will be consolidating our Tomball facility CNC equipment and fabrication capacity to Trinity. This move is an investment to strengthen the company’s position in the market and allow us to continue to streamline processes and increase our workforce in Trinity by 16 percent. As we execute Phase II we have built in additional safeguards to insure production will not be interrupted and the transition to Trinity will be complete within the next three months. Production capacity will remain at current levels during and after the move to Trinity. We stand by our philosophy of “We Deliver Confidence” and are looking forward to continuing to exceed our customer’s expectations. Once we complete this phase we invite you to tour our expanded facilities in Trinity. 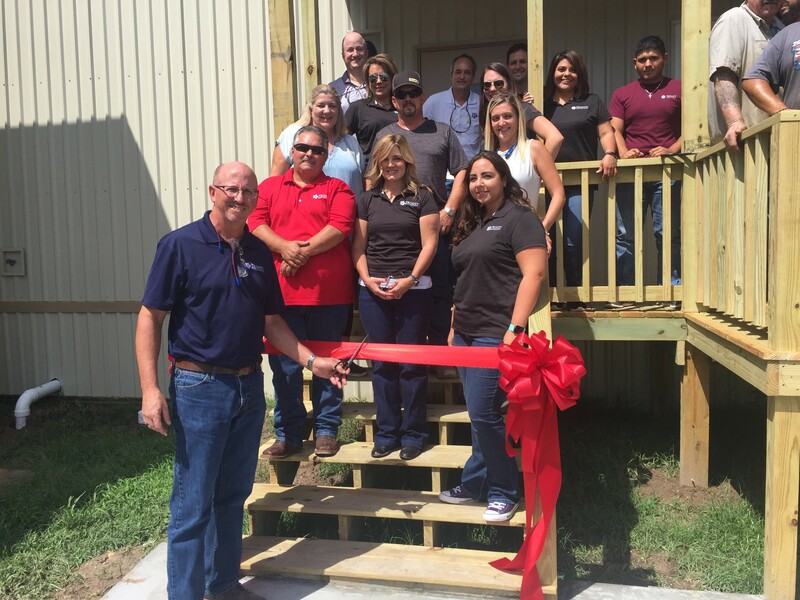 Trinity Steel Fabricators cuts ribbon on it newest addition to Trinity Steel’s South Plant in Trinity, Texas. This newly completed break room also doubles as a training room for its staff in Trinity, Texas. The new complex will be constructed adjacent to Sasol’s existing facility in southwest Louisiana. Under the contract, the Fluor and Technip joint venture will be responsible for the 1.5 million tons-per-year ethane cracker, downstream derivatives units and associated utilities, offsites and infrastructure work. The project is an $8.1 billion ethane cracker and derivatives complex. Trinity Steel was awarded over 10,000 tons for structural steel for the Ethylene Furnaces and Ethane Cracker. “Trinity is moving forward with facility and equipment upgrades that will help us deliver more of the highest quality steel faster than ever before,” said Richard Neal, CEO of Trinity Steel Fabricators. 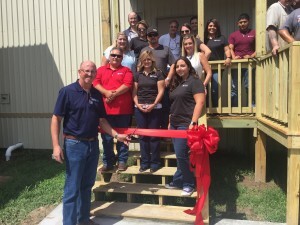 Founded in 1976 by the Karnes family in Trinity, Texas, Trinity Steel Fabricators has grown to become an international player in the construction industry by fostering a culture of quality and customer service. With AISC and CWB welding certifications, we participate in structural steel fabrication for petrochemical, mining, petroleum refining, power and other industrial environments. Our team has executed projects of significant size for all major EPC firms in the industrial market. Trinity Steel facilities are capable of producing enough structural steel to make us the largest independent fabricator in the market we serve. Trinity Steel Fabricators, Inc. acquired United Steel Fabricators, Inc.
Houston, TX – October 20, 2014 – Trinity Steel Fabricators, Inc. announced today that it has acquired United Steel Fabricators, Inc., a structural steel fabrication facility in Trinity, TX. United Steel was formed over 33 years ago and serves the oil & gas, petrochemical and power industries. The acquisition of the United Steel business adds 40,000 sq. ft. of fabrication space with a capacity of 8,000 tons per year. The United facility provides immediate additional capacity and provides for future expansion with its 14 acre property . “Trinity Steel has worked with United Steel for over 20 years and has great respect for their organization. United Steel has an excellent reputation for their quality and on-time deliveries. As one combined steel fabricator, Trinity Steel will be able to better serve our customers. In the coming months we will also announce additional plans for this facility as we prepare for the upcoming growth in our market place. ” said Richard Neal, President & CEO of Trinity Steel Fabricators Inc.
Posted in News, Press Releases | Comments Off on Trinity Steel Fabricators, Inc. acquired United Steel Fabricators, Inc.
First column arrives at the Cerro Verde Copper Mine in Ariquipa, Peru. With erection on track to start next week, every employee at Trinity is focused on getting the 14,000 MT project to the job site.